The affordable housing lottery has commenced for 83 brand new apartments at the Steinway Estates in Astoria, per the NYC HPD. Units will range from $895/month studios to $2,586/month three-bedrooms, with annual income requirements varying from $32,023 for a single-person household to $130,260 for a six-person household. The development at 19-80 Steinway Street is on the edge of the Steinway IBZ (Industrial Business Zone) and was originally known as the Vesta or Vesta Q when it first surfaced as a mixed-use project back in 2008. 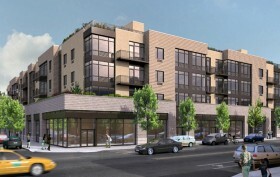 Exact details on the building aren’t clear, but renderings from Garrett Gourlay Architect show a four-story, corner-lot structure with landscaped outdoor areas and contemporary apartments.